William S. Leney for Bell's British Library 19 November 1791, line 10.3 x 7.3, pub. Bell's “British Theatre” (1797) vol 12, with the quotation "I greatly fear the flesh, and the weakness thereof hum" (Act V) William S. Leney printed C. Cooke 1807 and plate to “British Drama” 1817, line. Anne Lovely, with "a fortune of thirty thousand pounds," is shown as a Quaker in Obadiah Prim's house in Bath. Prim, a hypocritical Quaker, is one of Anne's four guardians. 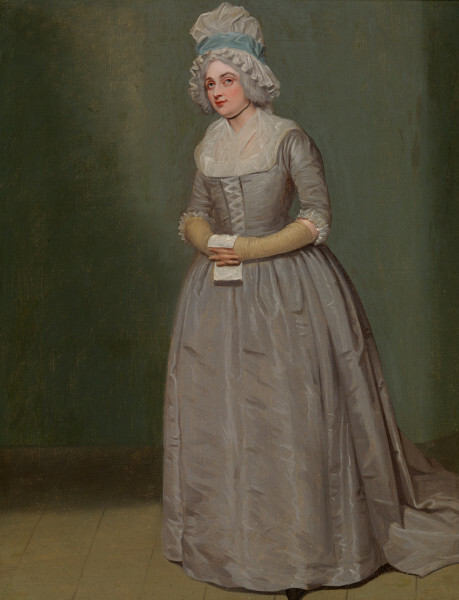 Anne's Quaker costume consists of long yellow mittens, a pale purple silk dress with touches of silver, a white fichu, a black ribband collier, and a white cap with a blue ribbon. Mrs Centlivre's comedy was first performed at Lincoln's Inn Fields on 3 February 1718. Mrs Wells played Ann Lovely for the first time at Covent Garden on 31 May 1787.